The TI-5033 SV (SuperViewTM) replaced the strange looking TI-5033 (II) but is still battery operated. The housing is identical with the TI-5034 SV. Dismantling the TI-5033 SV reveals once again the Toshiba TC83220 single-chip calculator circuit. Funny to note that an identical chip with just another mask option was used in the heavy duty TI-5660 desktop printer. 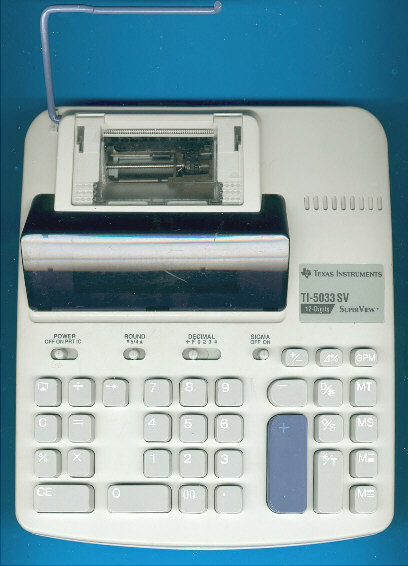 The TI-5033 SV is featured in the Texas Instruments Incorporated sales catalog CL-1233 dated 1994.